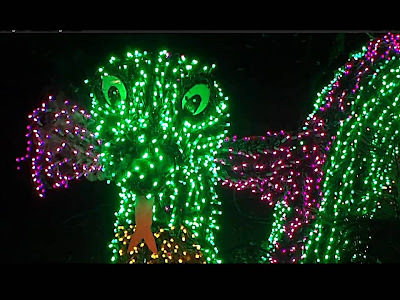 Christmas Light Show 2012 - ENJOY!! Fantasy (Free Digital Single) and more: MP3 Songs FREE to download! 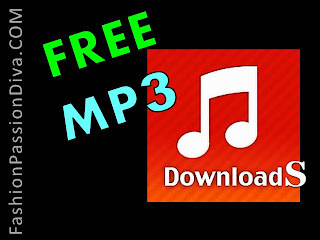 Fantasy - FREE MP3 Downloads - Click Here : No strings attached - completely FREE! Share these Free MP3s and spread the Love! My Holidays Gift to You - Enjoy! Free Robots Remix - Cool Sounds! 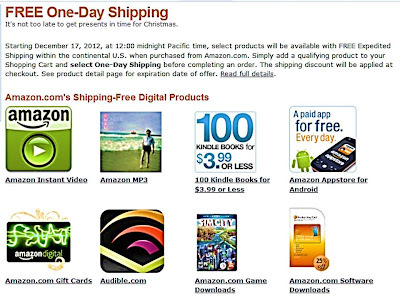 There's also FREE One-Day Shipping on Select Products - ONE Day Only! Hurry!! Christmas is nearly here!!! Only 3 DAYS Left TO ORDER!! Use two colours, black and white. try these if you have a steady hand - paint quavers or seminquaavers! 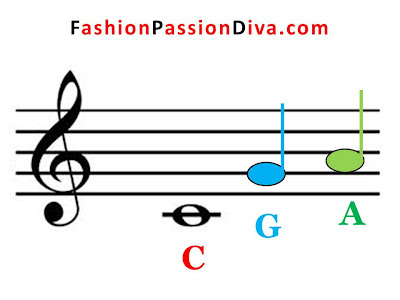 Paint - C, C, G, G, A, A G (G sits on the second line, A sits in the second space) - I have created this little score so you can see where the 3 notes are found (for the C major key of Twinkle). Remember to do two notes of each note, and only one for the last G.
(Tip: Don't paint the score, just the note, for middle C (the note that's crossed by a line through it). If you paint a treble clef on your thumb, you could paint two notes eg. C, C on your index nail, G, G on your middle finger nail, and A, A, on your ring finger and lastly, another G on your pinky nail! Try it out - sure to impress your friends! And then complete the tune on the other hand!! (Nb: The notes have been coloured so you can pick it out easily when you're painting the "twinkle little star" design.). One Direction Gets Pelted With Bras! If you're gonna throw bras try something that will grab his imagination? Tip: Avoid chunky bras with thick, heavy, metal fittings - in case you didn't notice it One Direction hurls bras back at the crowds!! 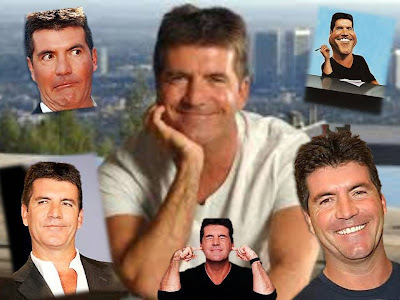 from what Simon thinks in Xfactor USA 2012). Trust me, you do NOT want to walk around with a black eye the next day! Would you throw it back if it was a fish-net thingy? Eat your heart out Simon Cowell! Psy's Got Style! Check It Out HERE! After featuring robots that go gangnam-ho here's the real deal! How about awesome energy and style? Gangnam style that is. Yep! You've gotta hand it to him - the man's got STYLE - and he knows it! See our pic below to discover what it is!! Here is the 'Abstract' Music Version of Gangnam! 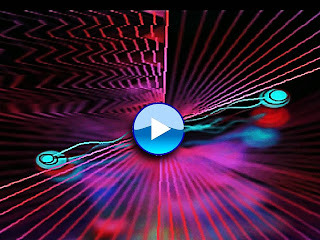 Psy's soundwaves are beautifully 'visualised' by Microsoft! By the way as the video on Youtube with the most views (approaching one billion views in only 4 MONTHS!! UNREAL!!) it shows just how spectacular this Gangnam movement really is. Though some cynics think it's a one-trick Pony, does it matter? This 'Pony' is estimated to bring in $ 6-7 million this year (many different estimates from different sources - quoted in euros, british pounds - suffice to say he will make up to 10 million but we have not accounted for Christmas sales yet! ), (been on YT for only 4 months - his YT earnings). That's much more than what other people's "thoroughbreds" earn in a (long) LIFE-TIME!! All this from just ONE HIT! Not bad for a baby horse!! I wouldn't be surprised if there is more to this Foal than meets the eye. I can hear the tills busy chiming this season ... all for the love of P$Y, sigh ... I can think of many more tricks this Pony can do. with FREE Super Saver Shipping!! And what about China? Bound to have fans amongst all that lot of humanity! all that bouncing and horsing around ... makes a change from all that Tai Chi, though. at the competitions would sure take to Gangnam I reckon!! What about you? YES YOU!! How are you gonna take the world by Storm TODAY?? Postnote: What's Bouncier than Gangnum? Gangnum on Kangoo Hoppers! You get twice more the FUN! How to be Fashionably TRENDY Without Splurging! don't throw out your 2012 wardrobe yet, take your favourite pieces and give it a new lease of life. Use your 2012 basics and add 2013's accents - with a little imagination and inspiration you can create a whole new wardrobe without spending a fortune. This video gives some good ideas on how to mix and match clothes, accessories and shoes for a total look. The basic black, white and pastel items are perfect mainstays as they're easy to recycle as backdrops for your new fashion statements. Lace is still in, add a new lacy cardy or jacket layer to update your outfit instantly. Lacy look collection. Belts: are quick and economical accessories that can spice up or update items, just buy the most current one and mix and match with other belts or wear by itself. Don't throw them out too quickly as they are easy to recycle, depending on how you mix and match. You can change their colours or jazz them up with beads, tassles, etc., same with shoes, and handbags (you don't need to spend a fortune to make a personal statement especially as fashion trends are transient, unless you want to). Colours: Yellows, lime, oranges are everywhere, so are turquoises - a bright, young, Tropical theme is evident. Have fun with sunny colours this season. Leos would love this theme - suits golden, playful cats! Tops: Short, crop, ruffled tops are still in .. so are jackets. Keep a couple of staples - for work/ business, and add a couple more for fun or accent (a romantic peach jacket is a versatile item). Skirts: Very short skirts still abound but there are full length, wide skirts, not too billowy but not pencil either. Still plenty of choice for more feminine or romantic tastes. Pants: A pair of skinny white pants gives a break from black tights. Great for summer, casual or formal. Add some fun shorts to your collection. Shoes: A pair of beige and black platforms are essential as classic staples for the serious diva, then throw on the fun and funky shoes when you need to make an accent statement, or if you're in a playful or casual mood. Definitely slip on your booties if you want to up the fashion-ante! 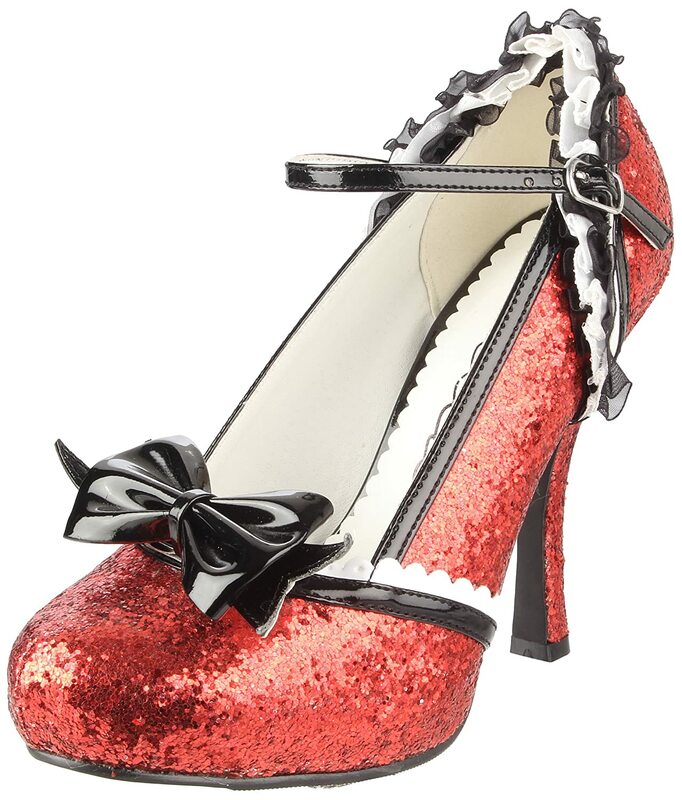 Below is just one sample of a pair of booties with a difference, in fire-engine red and bound to keep you on your toes! Jewellery: necklace - combine showy with more 'sedate' items; rings - any size goes; bracelets - wide or narrow - bangles, metal - - not so much bling overall. Acessorise! So easy to change the mood of an outfit by playing around with this. Definitely possible to get great bargains here. Take your high-street budget, add a dash of imagination, a dollop of inspiration, sprinkle confidence and flair liberally all over your cornflakes - and voila! - look a million bucks. Noone would be the wiser. TIP 1: Take what works and then adapt it for the next season with the smart use of accessories, styling and mix-and-match combinations that suit your own personal style. And don't forget the handbag - it's a very easy item that you can use to catapult an ordinary outfit into a street-stunner. PS: For the X-factor - cap it off with a trendy hat! See how Britney Spears does it @theXfactorUSA. TIP 2: Put the sparkle back into your relationship this season. If you've been neglecting your partner remember that when you are intimate, both of you experience closer bonding, due to the release of oxytocin, a bonding hormone, that according to the latest research, literally stops your partner from straying away from YOU. It doesn't have to be humdrum - light a (bon)fire and melt his heart now. And it doesn't have to be one way either - he'll love you more for thinking about him. You're Never Too Old When It Comes To Fashion! Madi Gaga - When You've Got Style, You've Got ... STYLE!! who runs an online fashion store on T-mall. Liu aka MaDi Gaga ('funny elderly') really has the looks, legs and even the poise of a Fashionista! that indefinable quality - that fun and flair for Fashion! The slight, youthful frame and the almost-elfin face with the short hair-cut looks the part. And he really has the kind of legs that many a gal would die for. His colorful combos obviously appeal to buyers as his grand-daughter will testify. Orders have been brisk and sales volume is up 500 %!! trendy jackets and sometimes women's wigs. PS: China's population is over 1.2 billion, to take China by storm is to literally win over millions of hearts. That means more following than some top celebrity profiles on Twitter! Not bad for a 72-year old! 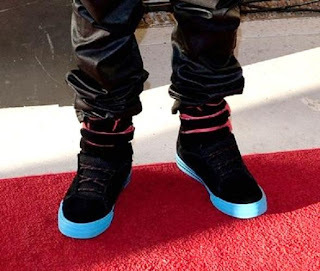 Justin Bieber has Style and Fashion Flair! We were not fans of this teenage idol but having looked at many of his photos recently we are impressed. Justin has a natural flair for clothes - he can wear stuff that would not only look unattractive on some guys at best, but downright out of place on others! Click on the Christmas Cover of his latest video on YouTube to see how well he showcases even the most casual of clothes! He is a natural model and is very photogenic as well - just check out the thousands (may be millions) of his photographs online. This lucky teenager has been endowed with more than his fair share of talent and looks - he has style and flair! And at the recent AMA awards on 18th November, 2012 Justin thanked and paid tribute to his mum several times. This can only increase his popularity ratings as it's obvious that he is well brought up and doing a great job of growing up. Parents should be happy that he is proving to be such a great role-model for teenagers. 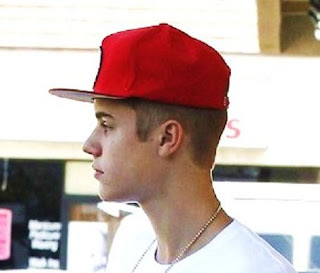 We like Justin's 'signature' style where he often wears interesting hats that match his funky shoes. 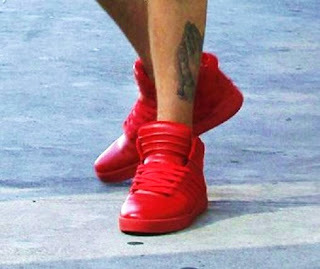 Look at Justin's Attractive Shoe-Boots in Fire-engine Red!! We like Justin's choice of clothes and his signature style where he often teams up eye-catching hats with shoes that make a statement. Not to mention those earrings that only serve to stamp his personal style in a way that not many young males can. In short we like Justin's style and fashion sense and the ability to carry it off with flair. Justin has a future in the Fashion Industry if he wants it. Finding time would be the challenge for anyone busy making platinum hits! Justin Bieber, Lady Gaga and Other Celebrities Donate Royalty-free Recordings for NZ's Starship Hospital's Christmas Album 2012. 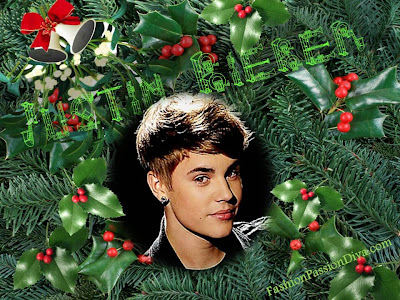 "UNDER THE MISTLETOE is a seasonal mix of traditional Christmas standards and newly penned holiday music largely co-written by Justin. The album is available both as a standard CD and as a deluxe CD + DVD edition. The latter includes four additional holiday songs on the CD, plus 25 minutes of behind-the-scenes footage and the video for “Pray” on the DVD. Other guests on the album include…"
Did you know, Justin Bieber also has his own line of perfume? Check it out here on my blog. And here on Pinterest. 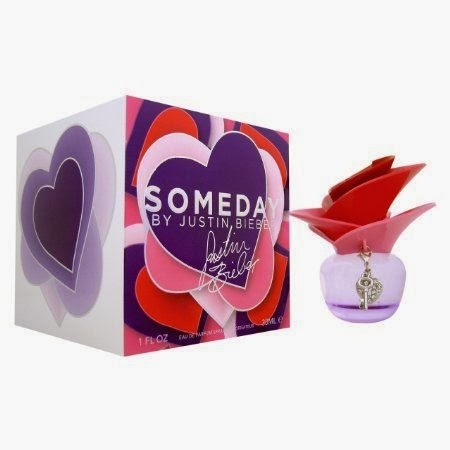 And we like his packaging and jar design - Justin's Someday Perfume. "Digital Fashion Week (DFW) is the world's first shoppable live streaming fashion week, collaborating with key partners YouTube and Google+ to bring the latest fashion to consumers in real time. ..."
"Digital Fashion Week Singapore debuted on 20th to 22nd October 2012, with supermodel Andrej Pejic, legendary fashion icon Patricia Field, America's Next Top Model cycle 18 winner Sophie Sumner and China's top fashion designer Guo Pei alongside 6 top Singapore fashion designer labels as part of the event." A beautiful, fashion parade, with intricate, 'cultural' details.showcased to the strains of Chinese (including the famous 'Butterfly Concerto' ) and other music including classical guitar half-way through the collection when some of the pieces showed an East-West fusion of fashion. All in all an inspiring, elegant, visually-rich collection with strong, traditional Chinese design elements and details, imaginatively incorporated in a modern and artistic way with some fusion of East and West in some of the designs.